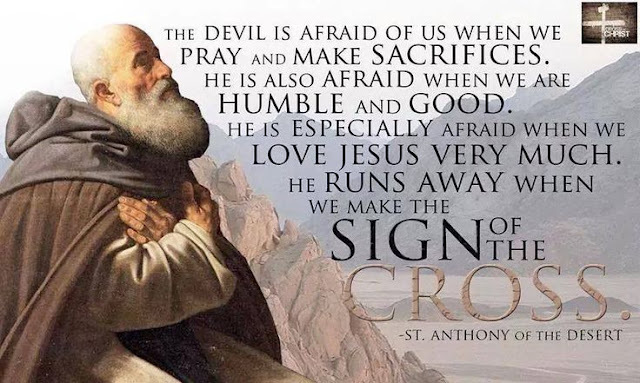 Catholic News World : Quote to SHARE by St. Anthony the Great : "The devil is afraid of us when we pray and make sacrifices...He runs away when we make the Sign of the Cross. " Quote to SHARE by St. Anthony the Great : "The devil is afraid of us when we pray and make sacrifices...He runs away when we make the Sign of the Cross. " "The devil is afraid of us when we pray and make sacrifices. He is also afraid when we are humble and good. He is especially afraid when we love Jesus very much. He runs away when we make the Sign of the Cross."